These are the GIABAO Hotels, are two of the best mid-range hotels in Hanoi, each with unique features and outstanding services. 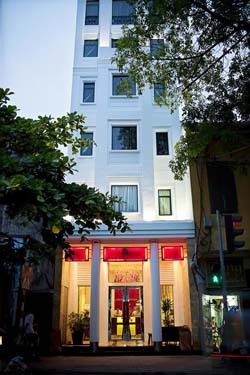 Conveniently situated in the heart of Hanoi, the GIABAO Hotels are just 150 meters from the famous Hoan Kiem Lake and within walking distance of many tourist attractions such as the Ngoc Son Temple, the Hanoi Opera House, the Thang Long Water Puppet Theatre and the special atmosphere of Hanoi's Old Quarter. The GIABAO Hanoi has 28 rooms in a western-oriental style which cater for all your needs. The GIABAO Grand has 35 rooms which offer a luxurious blend of Oriental art and Western Architecture. Outstanding service is at the heart of our philosophy. Our highly professional staff are always attentive and available to make every aspect of your stay with GIABAO Hotels a pleasure. Please contact us and let us show you what authentic Vietnamese hospitality is! In Gia Bao Grand hotel, we boast of offering these two superfine rooms as the worth choice for the business guests or for the person who would like to make the most of the special. Through the enlarged crystal glass-window you can freely enjoy the beauty of Red River on which the over 100-year old bridge built by French architect named Long Bien bridge stand out as a brilliant historic evidence. * High speed Wifi Internet in complementary. * Multi-channel satellite Tivi (2*32 inch LCD). * Complimentary welcome fruit and fresh flower. * Complimentary 2 bottles of mineral water per day. * Large working desk and Executive chair..
* Bathroom with saunna and jacuzzi. • Transportation Services ( 4 – 16 seats). • A la Carte Menu. • Many Extra Tour Services.